my friend george lam kuen tat was in town 2 weeks ago for work, and he came along with his wife donna. she's actually filipino, although when i first saw her during the SIF alumni conference last year, i thought she was singaporean, and i figured she must just be close to the pinoys because she posed with us for a souvenir shot of the philippine delegation. funny thing is that after one of the events, some of us went to see george's new, well-appointed flat near holland village, and donna was the only one who wasn't from SIF '97. george took out all these board games, and i was intrigued to find out that donna was around when he bought all of them, as a consequence of a mid-life crisis of sorts. then, shinto (from indonesia) and i began whispering to each other that donna and george looked good together and would make a good couple and that we should set them up or something. but of course, our stay in singapore was limited, and we had to leave shortly after that late night soiree. at the time, donna and george were not an item. then, i began noticing some upheavals in donna's facebook (last year, i was still active in that networking site, but not anymore), and i put two and two together and concluded that even without our help, donna and george discovered something in each other and became an item. so i was happy for both of them. then sometime in june, i received an update from facebook (it was at this time that i had changed my language settings to french), about donna's status. i had to think about it twice and whether what i knew of french was sufficient to conclude that donna was -- gasp -- married. so i opened facebook, and there it was: photos of their wedding in las vegas! how cool is that! it was so sudden that apparently, no one in george's SIF batch had known about it, so when i squealed the event, everyone was equally -- but happily -- surprised. 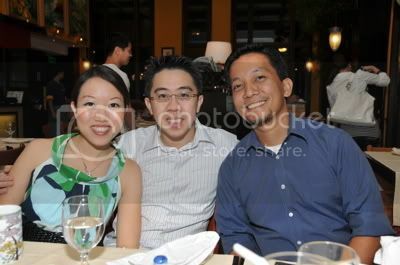 anyway, this picture was at portico in serendra. george had been to the country before and he was quite surprised to find so many new things since 2002. anyway, congratulations george and donna! there really was magic when i saw the two of you together. it was meant to be.